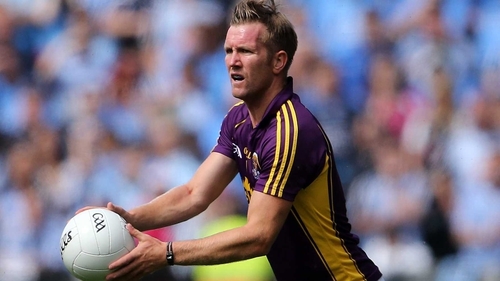 Three brilliant points from PJ Banville in the second half gave Wexford their first championship win of the summer as Seamus McEnaney’s side reach Round 2B of the qualifiers with a 0-12 to 0-11 win over Limerick. A tight battle went Wexford’s way in the final quarter as Banville and Ciaran Lyng kicked vital scores, although Limerick will look to late wides from Jamie Lee and Iain Corbett and know they had the chances to at least force extra-time. Corbett also fired a first-half penalty over the bar for Limerick, but Wexford were fully deserving of the victory at the Gaelic Grounds. Aided by a stiff breeze in the opening half, Limerick looked slightly tentative in the opening action, and they struggled to make the most of the conditions. And it wasn’t until the 11th minute that the first score of the game arrived. Brian Fanning started the move from the back after a smart interception, and after a nice switch of play from left to right, Seamus O’Carrol pointed for Limerick. With the deadlock broken Wexford soon levelled when Ciaran Lyng pointed a free from the left, but when Limerick goalkeeper Donal O’Sullivan carried well from goal and launched an attack, Ger Collins pointed the free that followed to push Limerick ahead. Wexford struggled in their Leinster championship defeat to Carlow, but they didn’t seem to carry much of that woe into this game, and after Lyng drew them level with a good point from the left, Michael Furlong stole the following short kick-out to give Wexford a 0-03 to 0-02 lead. Considering that Limerick won their last four national league games and only lost to Clare in the provincial championship by one point, there was an understandably confidence to their play. Captain Corbett was a real threat breaking from centre-back, Darragh Treacy was also string on the front foot, while goal hero against Clare, Josh Ryan, showed his class with a hooked effort over his shoulder which levelled the game again after 24 minutes. A Lyng free and a great score on the break from Adrian Flynn – only O’Sullivan’s stop denied him a goal – saw Wexford open out a two-point lead for the first time seven minutes from the break, but Limerick finished the half strongly when Ryan moved out to midfield following the withdrawal of David Ward. Ryan’s mark was moved closer and Sean McSweeney converted the free that followed, but Limerick would have been dismayed to only be 0-07 to 0-07 level at half-time, when Corbett blasted a 33rd minute penalty over the bar for the home side. Both sides employed a sweeper at the Gaelic Grounds – Conor Carty and Peter Nash – but Nash was bypassed altogether in the 39th and 43rd minutes when PJ Banville clipped over two points from distance to give Wexford a two-point advantage. Collins missed an easy free to cut that advantage, but Limerick rallied well and Danny Neville and sub Jamie Lee saw the match squared up again at 0-09 each after 51 minutes. Substitute John Tubritt and O’Dea swapped points as time ticked away, and Lyng and Treacy did similarly, but the winning score fell to Banville with a long range free a minute from time. Wexford: S Roche; M Furlong (0-02), B Malone, J Rossiter; E Nolan, J Wadding, T Rossiter; D Waters (c), N Rossiter; B Brosnan, K O’Grady, A Flynn (0-01); C Carty, C Lyng (0-04, 0-02f), PJ Banville (0-04, 0-01f). Subs: J Tubritt (0-01) for O’Grady (47 mins), P Curtis for Brosnan (54), J Firman for Flynn (63). Limerick: D O’Sullivan; S O’Dea (0-01), J McCarthy, G Noonan; P White, I Corbett (c) (0-02, 0-01pen), B Fanning; D Treacy (0-01), D Ward; P Nash, J Naughton, G Collins (0-01, 0-01f); S O’Carroll (0-02, 0-01’45), J Ryan (0-01), D Neville (0-01).